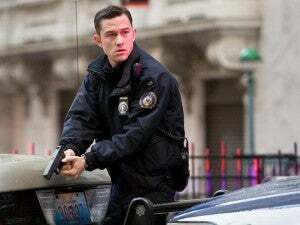 DC Entertainment Co-Publisher Dan DiDio recently hinted that John Blake, the Gotham City Police Officer played by Joseph Gordon-Levitt in Christopher Nolan's The Dark Knight Rises, could be coming to DC Comics soon. But what about a return to the big screen for the character? Levitt was on the couch with Jimmy Kimmel last night, and talked about his feelings toward the possibility of a John Blake-driven feature film. "I was a fan of those movies before I ever met Chris [Nolan] or did Inception or thought I was going to get to do The Dark Knight Rises," said the actor. "[Nolan is] such a great storyteller and filmmaker, it's an honor." Pressed whether a John Blake movie was in the cards, Gordon-Levitt literally threw up his hands. "I don't get to decide those things, man," he told Kimmel. He continued, though, telling the host that "I don't think [the ending of The Dark Knight Rises] is necessarily a set-up. I think it is the great ending for that trilogy. Even if you go back to Batman Begins, he's talking about how Batman is more than a man, it's a symbol, and a hero can be anybody and we all have heroes inside of us. That's a theme that runs through the entire trilogy." You can check out the interview, and more (including lots of talk about Muppets) below.